K: If you are from Texas, you have probably heard of the wine country that is Fredericksburg. 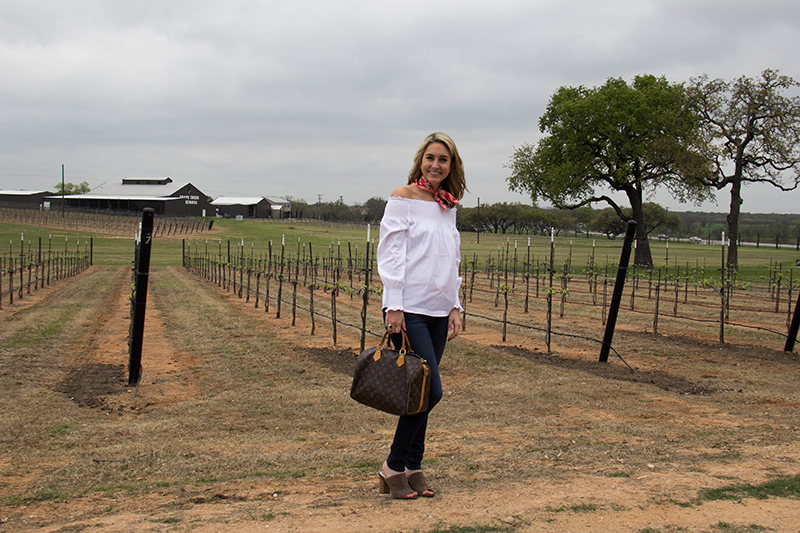 This charming city offers adorable bed and breakfast hotels, fabulous shopping, and true Texas wine from vineyards located just outside of the town. Brandon and I took a day trip from San Antonio and spent some time sampling the local wine flavors of Grape Creek Vineyard. B: Everyone has their own personal preferences when it comes to wine. I personally do not drink wine often, but when I do, I honor the world’s most interesting man by preferring deep rich reds. I enjoy tasting wine by the sip rather than drinking by the glass, so this wine tasting afternoon date was absolutely perfect. Determining the best article of clothing for you in just the right social environment can take a lifetime to develop; it is just one of those things in life that gets better with age. 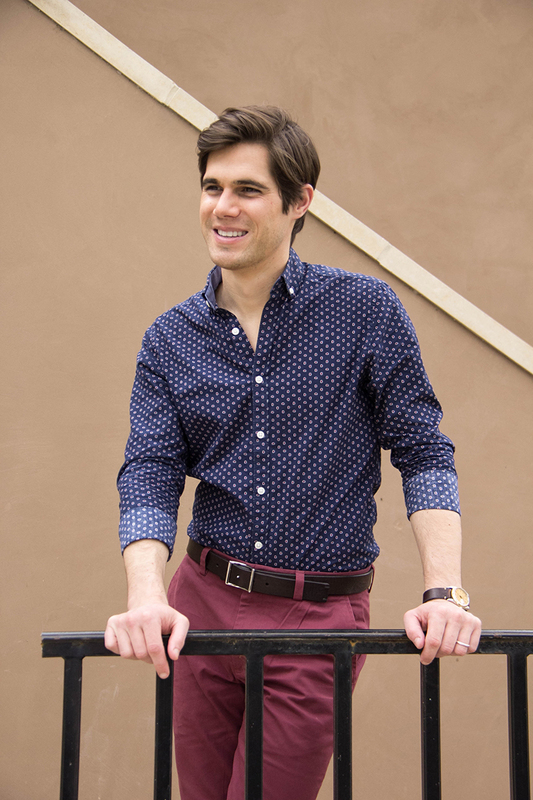 This deep navy blue button down with subtle white and red paisley is not only time-honored, but also patriotic, and a fun break-up from plain-print button-down counterparts. 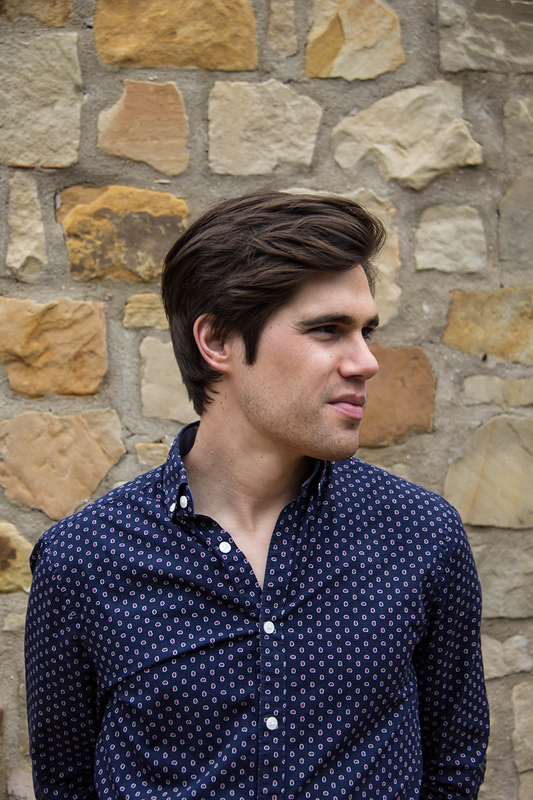 B: In the past several years, craft wineries have sprouted up all over the hill country region of Texas. 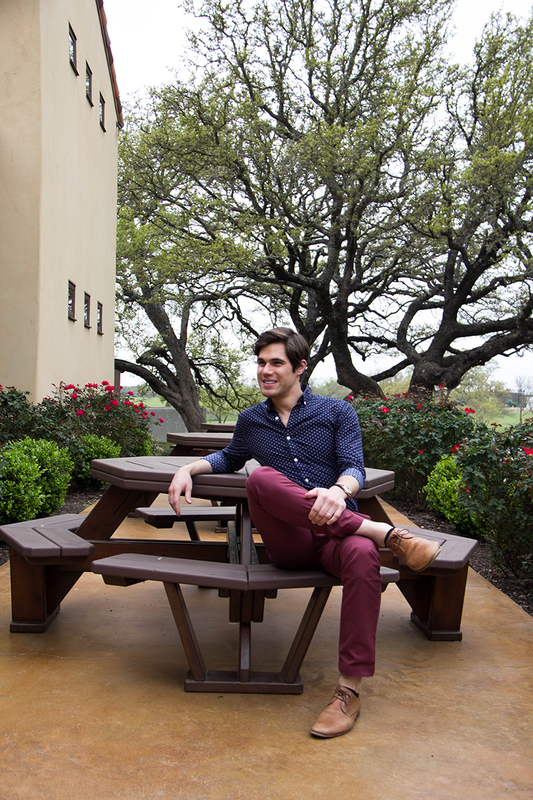 Tourism in the Texas wine country has grown exponentially, as have the number of individuals who seem to know everything possible about fermented grape juice. Pending on the winery you visit and what time of day you go, tastings range from a casual setting to quite a formal affair. The key is to look as through you fit perfectly in both settings. Chinos are chinos no matter the brand name, allowing entrance into every setting, no matter the time or season. A great fit and color can make all the difference if you are wanting to impress with a vivacious pop, or keep it subtle with undernotes of classy style. 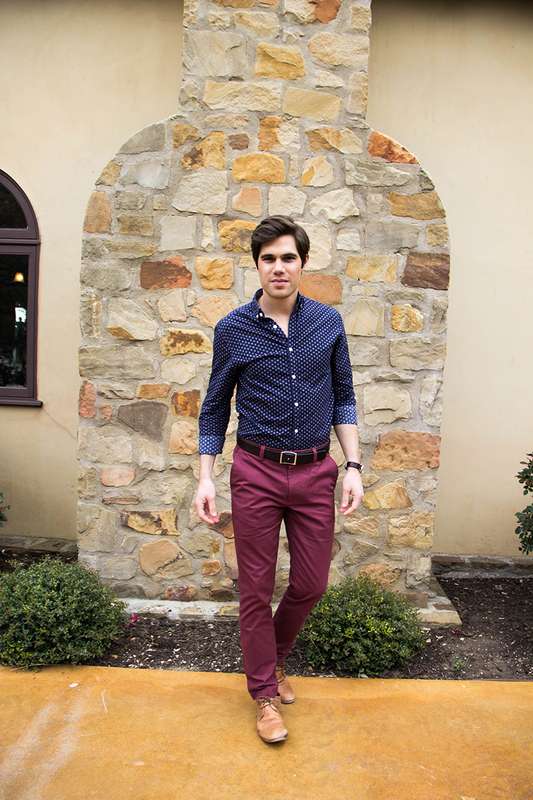 This burgundy colored Banana Republic chino perfectly brought out the deep rich hues of Grape Creek Vineyard’s light merlot. K: With the off-the-shoulder trend right now, I’ve felt like some of my outfits have a missing piece. 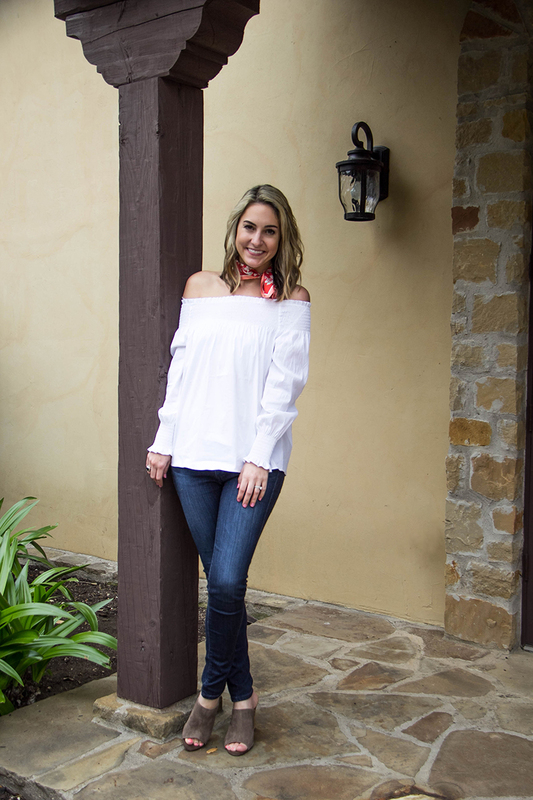 A necklace can take away from the top and can clash with the overall look; however, when I found this silk scarf at Loft, I knew that it would be a great addition for my smocked, white off-the-shoulder blouse. 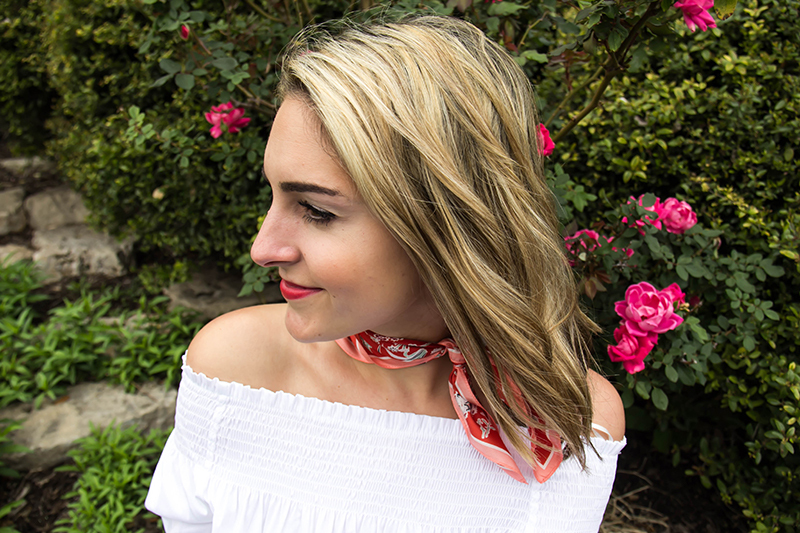 We’re putting together another post on 5 ways to wear a silk scarf so that you can try the trend for yourself, so be on the lookout or you can subscribe to our newsletter and get a heads up when the post goes live! K: This outfit was perfect for wine tasting. Not only was it extremely comfortable, I felt like it managed to come across as trendy and classic, something that’s often difficult to accomplish. I’m still loving the off-the-shoulder trend. 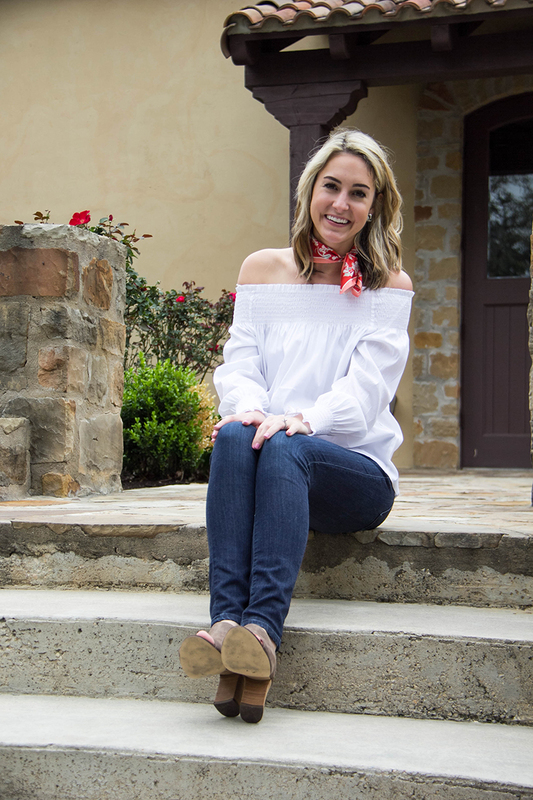 I picked up this blouse at TJ Maxx at a great price and I’ve linked some adorable blouses that are quite similar like this one and this one. I highly recommend adding a white blouse to your wardrobe for spring. The long sleeves make it easy to wear at night when the temperatures drop. Paired with my AG jeans and peep toe mules, this look is one look I’ll be wearing on repeat.